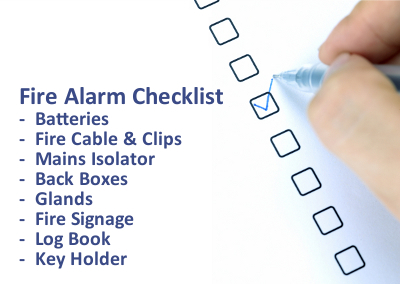 We are regularly asked this question when quoting a fire alarm system so it is about time we wrote this article covering what we consider to be the main items overlooked. Despite the common misconception, almost all fire alarm panels do not come supplied with batteries. There are various reasons for this including preference between battery brands and some panels having the option to take several different size batteries so this choice would be determined by battery calculations. Our two most popular panels, namely the Fike Twinflex and Zeta Infinity, have enclosures which only allow 3.4Ah batteries leaving no choice. However it is still vital to calculate the load on the system to ensure these will provide adequate standby time and this check must include any auxiliary equipment powered by the panel such as door holders. According to BS5839 all systems must be wired in fire rated cable which is rated at 30 minutes minimum. Fire cable is available with different core diameters so you must check the requirements of your panel and whilst you can use cable with a larger diameter each panel will have a minimum. During install this cable must be fastened using a non-combustible material which is usually achieved using fire rated clips. The cable should be clipped every 30cm during a horizontal run and 40cm during a vertical run. This is also the case even when the cable is under trunking. A means of isolating the mains supply which is within 1m of the panel must be available. Various options are available including a fused spur however we supply a dedicate key operated mains safety isolator specifically designed for use with a fire alarm system. By default most devices (detectors, sounders, etc.) have enclosures allowing for rear cable entry only. If you intend to use surface cabling then you will likely require a deep back box or base which will have knockouts for side cable entry. Leading on from the previous point in the scenario where cable is entering via a knockout, including the fire panel itself, a fire rated stuffing gland is required. Mandatory signage including fire action notices which list a number of actions building occupants must follow in the event of a fire. Once a system is installed all events should be documented with a date and time. These events cover the service and maintenance plus the end user is responsible for documenting any alarms including the weekly call point test. Despite not being a mandatory requirement, most systems will have a few different keys (panel access and/or control, call point reset, etc.) so having a fixed and secure place to store these is sensible. If you think we’ve missed anything please let us know as we always welcome feedback. How about instruction to the premises occupier on ‘How, when long the alarm system must be tested’ to comply with BS 5839. I find this is one subject responsible persons have no knowledge of. most think monthly id adequate !!!!!!. Very good suggestion Les, we’ll update this article shortly to include it.